Horses have an advantage over cows, donkeys, mules and pigs. When one of the latter stands in a field, they just look bored. But horses have gravitas. They hoist their head high, and we humans imagine they're thinking great thoughts about liberty and sacrifice when they're really sniffing for hay. And so for the second time in two years after 2010's Secretariat, Hollywood is trotting out a stallion it believes is a surefire star. To cover its bets, it races this horse through every popular film genre in less than two hours: childish heartwarmer, family drama, prison breakout and five shades of war picture that cover every emotion from nobility to torture to surrealist comedy. Director Steven Spielberg doesn't have a steady grip on War Horse's careening tone, but he'll be damned if there's not 15 minutes in there for everyone. (But parents with equine-obsessed children whining to see the flick should leave at the halfway mark when the horse starts pulling tanks.) Whether people will pony up to see Spielberg's latest in theaters will be a measure of the drawing power of the Spielberg brand. But though War Horse is achingly sentimental, the people who will cry the most are the Washington lawmakers who just legalized selling horse meat in America ten days before War Horse's release. Bad timing, dudes. In a small farm in Devon, 200 miles southwest of London, a gimping drunk (Peter Mullan) angers his wife (Emily Watson) when he buys the wrong pony. "You were supposed to get a common plow horse!" she gripes, but instead he's spent triple the cost on what she dismisses as a "fancy," a long-legged, high-stepping stallion better suited for prancing about with a nobleman on its back. 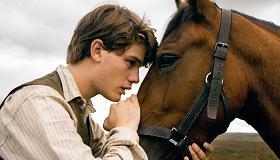 But their only child Albert (Jeremy Irvine, an unnaturally handsome kid) latches on to Joey and treats him like the combination best friend/puppy he's never had, even teaching the horse to come when he whistles. Communicating in moist eye contact and, well, English (Joey responds to motivational speeches), the two form a man-horse bond that grounds the film, and also causes us to wonder if Albert would have been better off getting a girlfriend. Years later during the war, surely someone alongside him in the trenches must have thought it odd this soldier was clutching a picture of his beloved pony. Spielberg sets these early scenes in an impossibly bucolic countryside. The thatched-roof house is poached from Snow White, the hills stretch on forever and even the rocks seem to glow from within. As for the village, it's the sleepy kind of place where Albert's new horse is the hottest gossip in town—the entire populace shows up at the farm just to watch him plow. With John Williams' cloying, cloddingly playful score doubling-down on the goofiness, the only possible rationale for this ludicrously saccharine opening is that Spielberg is setting up how much World War I will change this world, as though he's tsk-tsking, "Like green trees? In Act Three, they'll be flaming stumps." Joey (or really, the 13 different horses who together play Joey), is a better actor then several horses Disney cast to play Secretariat. Though the ways a horse can express itself are limited—a tail flick, lowered ears, rearing, stomping—we're never in doubt of what Spielberg wants us to think Joey thinks. (Still, he's nearly out-acted by a goose whose been trained to pull on the pantlegs of his enemies.) But once the war starts and Joey is sold to the Army, he's shuttled through a series of owners that includes soldiers of all stripes: British, French, German and deserting. Along with him is Albert's father's old ribbon from the Boer War, a totem that begins to feel like bad luck given that in service of the fast-moving plot, each owner that clutches it soon loses the horse—or often, his life. War Horse was a child's book that became a stage play that became a bigger stage play now poised to tour America in 2012. Its theatrical roots peek through in the second half of the film when Spielberg decides they give him permission to, say, color the sky blood-red for over-heated dramatic effect. But he mostly keeps its past buried, preferring the tidily generic film language of short scenes, steady editing and a relentless soundtrack where the drumbeat is the thudding of hooves and the rat-a-tat of machine gun fire. Yet the best ten minutes of the movie are pure theater—the sacred space of patience and silence—in an eerie stretch when two enemy soldiers meet in No Man's Land for a horse rescue operation. If you can forgive that amidst this mass slaughter of man and beast, the entire front takes a time-out to save one living thing, the scene is a masterpiece of hushed tension and bleak humor. And tellingly, it's the one scene in the movie that doesn't announce how you should feel. For every 1,500 British horses sent to the war, only two returned alive. After the first battle scene, Spielberg pulls up the camera to survey a field full of corpses that's crowded with more horses than men. The math seems wild—almost as if horses must have been riding other horses. That it's a senseless waste of life is indisputable, yet Spielberg is determined to make the case anyway. To do so, he cribs from a series of unfortunate events: the slave abuse of Spartacus, the wide screen decimation of Gone With the Wind, and above all, the sad swamp death of the horse Artax in The Neverending Story. If you're part of the generation that considers that scene the most wrenching 106 seconds on film, the good/bad news is that War Horse stretches it out for a half-hour. And for audiences who somehow still haven't gotten the point that humans shouldn't drag other species into their squabbles, Spielberg saves his most audacious influence for last when Joey—pricked by barbed wire and pinned on crossbeams of wood—blinks balefully at the camera as if to say, "Are you really going to make me die for your sins?"